Izzie’s released a set of Eyebrow appliers for LAQ/Omega mesh heads at Izzie’s mainstore for Fifty Linden Fridays. 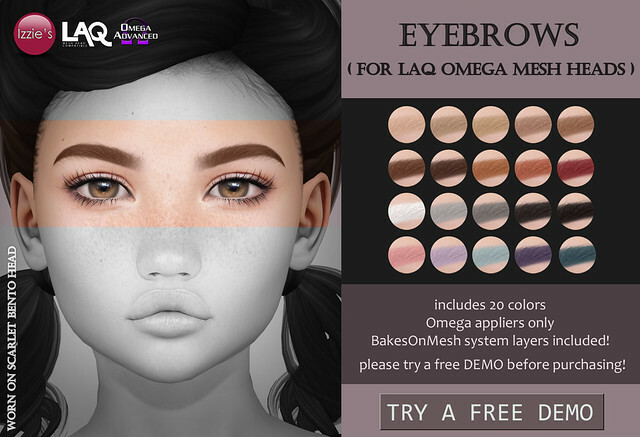 The set includes 20 eyebrow colors (Omega appliers and BakesOnMesh system tattoo layers) which are tintable with your mesh head Hud. The eyebrows were made for the LAQ Scarlet Bento head but may also work with other mesh heads from LAQ or other Omega compatible mesh heads. To make sure they will work for you please try a free DEMO before purchasing!